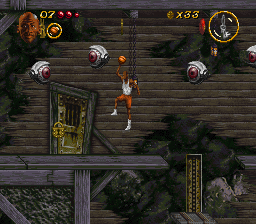 All-star Michael Jordan powers through the defense in the sewers beneath Chicago, a notable achievement despite the defense's lack of arms, hands or legs. CHICAGO, IL – An evil scientist known only as Dr. Cranium was defeated today by famous basketball player Michael Jordan, who bludgeoned the scientist’s minions into nonexistence with a seemingly unending supply of basketballs hurled with great force, witnesses say. Cranium’s attempt to kidnap the the all-star charity game lineup, including a number of players nowhere near as famous as Michael Jordan, was foiled in a number of bizarre locations which have nothing to do with basketball. One of them, as is customary in these situations, was a sewer, and predictably populated by spiders, bats, floating eyeballs, and zombies. These hideous obstacles didn’t stop Jordan, though; witnesses report that, at worst, Jordan grunted and seemed to flicker slightly when injured by his monstrous foes. The all-star charity game has been rescheduled for next Saturday, immediately after Dr. Cranium’s lynching that same morning.